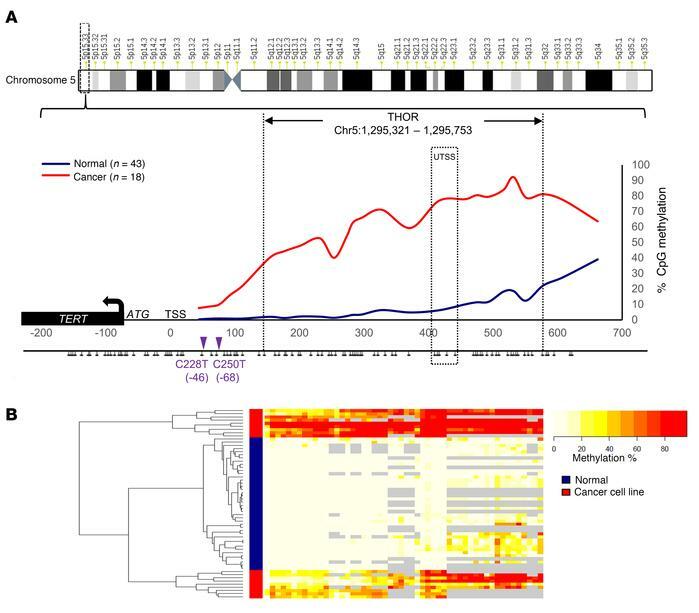 Defining THOR through DNA CpG methylation analysis of the TERT promoter. (A) Average CpG methylation of the TERT promoter in normal cell lines and tissues (n = 43, blue) and TERT-expressing cancer cell lines (n = 18, red). THOR is a 433-bp region (–140 to –572, relative to the TSS) comprising 52 CpG sites and located adjacently upstream of the common C228T and C250T TPMs (purple triangles). The UTSS encompasses 5 CpG sites within THOR. ATG and TSS are the start codon and TSS of the TERT promoter, respectively. Lollipops represent individual CpG sites. (B) Methylation heatmap generated from unsupervised clustering displays the methylation percentage of each CpG site within THOR for normal cell lines and tissues (n = 43, blue) and TERT-expressing cancer cell lines (n = 18, red). Gray color indicates unavailability of data.